10% of wood production in the United States is used to repair rotting wood. Wood rot destroys about 20 billion board feet of timber each year -- far more than the annual amount destroyed by fire damage. Repairing wood damage in crawl spaces caused by rot, mold, and termites can seem like an overwhelming and expensive project. However, if you can catch the problem before it becomes too severe, it can be quickly and affordably remedied by a professional crawl space contractor. Simply repairing mold damage is not a lasting solution. If the conditions for mold to regrow exist (moisture, warmth, and a food source), mold will simply resume growing on your new wood over time. At Innovative Basement Systems, we specialize in repairing crawl space issues of all types, including moldy or damaged wood. For a free wood damage quote, call or e-mail us today! 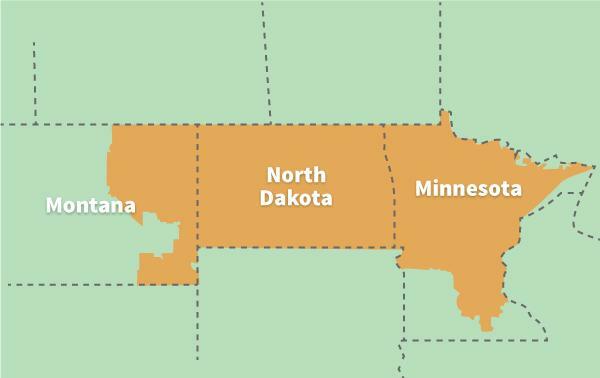 We serve the Minnesota, North Dakota and Eastern Montana area, including surrounding areas such as Bismarck, Saint Cloud, Eden Prairie, Grand Forks, Minot, Anoka, Andover and nearby. Many homeowners and contractors make the mistake of repairing the damaged wood and calling the problem solved. But what about the cause of the damage in the first place? Removing Water Sources: All plumbing issues and groundwater leaking must be addressed, or your replacement wood will rot. Remember: there is often more than one source of water leakage in a crawl space! Fix Any Grade Line & Gutter Issues: If your gutters are depositing water around your foundation, or the ground around your home is sloped towards the house, then water will collect around (and inside) the crawl space, promoting mold and rot. Eliminate Pest Infestations: If you've had termites, carpenter ants, or other pests in your crawl space, you'll need a pest inspector to make sure they're eliminated. Termites can abandon sections of their nest while still being present elsewhere in your home. If left unchecked, rot and mold can lead to serious structural damage. A professional can help find the source of the problem and provide a permanent repair solution. In the case of structural wood, the entire piece -- not just the damaged portion -- will need to be replaced or reinforced. This is true with structural posts, floor joists, beams, and similar wood. The nature of the problem in your home isn't always clear to an untrained eye. A professional should be called in to identify what caused the damage so it doesn't reoccur. As mold begins to grow, it feeds on the sugars, starches, and other compounds in wood. Living wood protects itself from this kind of mold and rot damage with its bark. Bark is absent of the sugars and starches that mold eats, discouraging mold growth. When wood is cut and processed, it loses this natural layer of protection and opens the door for mold and rot growth. Surface mold is able only to consume the sugars and starches in the wood, which does not influence the strength of the wood. Wood rot is able to consume sugars and starches as well, but it's also able to convert the structural polymers in wood fibers to food, which weakens the wood's strength. If you have surface mold, it can be cleaned off without having damaged your wood. Wood rot is a deeper problem that may require serious repairs. Crawl space jack posts do more than just reinforce your rotting crawl space beams and posts -- they can also be used over time to attempt to restore your floor to its original, level position. Often, it's not necessary to replace the wood -- even when the crawl space frame shows mold damage. In these cases, we recommend crawl space jack posts, also known as crawl space supports, to repair the damage. These adjustable support beams can be installed quickly underneath your home to restore strength to your structure. If your structural support beams are rotted, a sister beam of new wood may be installed along the old one to add structural strength. Crawl space supports are appropriate to repair crawl space support posts that are rotting, as well as supports that are sagging due to poor supporting soils. They're also an effective solution for crawl spaces that are sagging due to a poorly designed crawl space -- one that was originally created with too few supports to bear the weight of your home. Move Firewood & Debris Away From Your Home: Termites, carpenter ants, wood-boring beetles, and countless other pests take refuge in piles of wood, leaves, and debris. Keeping these away from your home helps prevent the colonies spreading where they're not welcome. Seal The Crawl Space: Summer humidity and winter cold can make its way into a crawl space through the vents. Crawl space vents are also an open invitation to termites, mice, and other pests. A plastic liner can, airtight vent, and door covers will hold back moisture and humidity, and create a physical barrier between pests and your home. Dehumidify The Crawl Space: Mold, rot, termites, cockroaches, and other pests all need a source of water to survive. Drying out the space with a self-draining dehumidifier will help to keep these unwanted critters out.